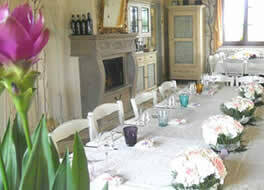 The romantic farmhouse Taverna di Bibbiano is the ideal location for your wedding in tuscany. We organize your wedding Ceremony in tuscany: let's celebrate your most Beautiful Day with a romantic ceremony in the beautiful panoramic Park with breathtaking views over San Gimignano, in the fields of sunflowers and lavender or in the rose garden . Your wedding Reception (Wedding lunch or dinner wedding) in the romantic restaurant Taverna di Bibbiano with stunning views over San Gimignano and the beautiful hills of the siennese territory. Excellent food, romance, unforgettable views ! Plan your wedding in tuscany by romantic farmhouse Taverna di Bibbiano and you will live tuscany and Italy at their best. Our Restaurant only for you? La Taverna di Bibbiano is a farmhouse hotel and restaurant in tuscany, overlooking the Chianti hills and San Gimignano, at few minutes from Colle di Val d'Elsa, San Gimignano, at half an hour from Volterra, Siena, Monteriggioni, Chianti wine road, at 40 minutes from Florence. The wedding "Among the Sunflowers", "Lavender Dream " wedding, "Shabby Chic" wedding, "Total White" wedding, "Under the Stars" wedding, "Christmas Theme" wedding, "Sweet Fall" wedding... The romantic farmhouse Taverna di Bibbiano is the ideal location for your romantic wedding: we will make your wedding in tuscany unique and special. The rooms and suites of our romantic farmhouse will offer you a stay in tuscany full of beauty and romance: Each room or suite is named after a flower and carefully furnished with fine furniture and romantic fabrics. Our rooms offer a panoramic view over the Sienese countryside. 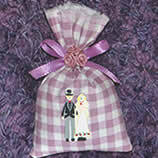 The romantic farmhouse Taverna di Bibbiano cultivates flowers and creates romantic wedding favors, lovely, colorful and fragrant sachets of lavender or heart-shaped lavender pillows, dolls filled with flowers, potpourri, flower arrangements .. Book favors for your wedding at Taverna di Bibbiano! Come visit us at the farm shop, write or call us for more information. 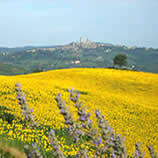 Our sunflowers and lavender crops as well as our rose gardens with panoramic views of San Gimignano are a natural photographic set ... the ideal photographic set for your wedding! 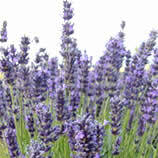 the photos among lavender fields and sunflowers will stay forever in your memory ... The romantic farmhouse Taverna di Bibbiano is surrounded by flower gardens, roses, butterflies alighted on the lavender, lavender fields, fields of sunflowers ... nothing more romantic than you and your guests running among the flowers .. Almost a dream ... but no, it's the Taverna di Bibbiano! Our farm grows flowers thus we will be glad to take care of the flower arrangements for your wedding in tuscany: the flowers will be protagonists of your wedding .. if you wish, flowers will be protagonist even for the presentation of the dishes. The Farmhouse and romantic restaurant Taverna di Bibbiano is located in tuscany, 5 minutes from Colle di Val d'Elsa and San Gimignano (Siena). Between Siena and San Gimignano, near Chianti, the romantic farmhouse Taverna di Bibbiano is the ideal location for your wedding in tuscany, your wedding in San Gimignano or for your honeymoon in tuscany. The romantic farmhouse Taverna di Bibbiano is the ideal location for your romantic wedding in tuscany, your wedding in San Gimignano, your honeymoon in tuscany, your next charming romantic weekend in tuscany. 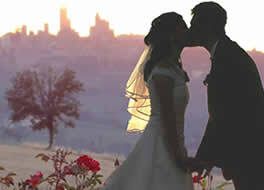 The romantic restaurant organizes romantic weddings and romantic dinners by candlelight.